This recipe for wood conditioner uses only 2 ingredients, and both are items you already have at home! No more expensive store bought products! For just a few pennies you can bring some life back into your older wood furniture, such as tables (kitchen, coffee or end tables), cabinets or hutches, etc. I originally found this recipe at Lily and Thistle. 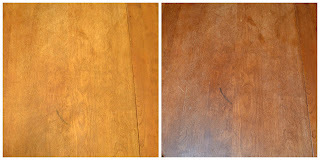 I have an antique maple kitchen table that is in need of being refinished. My husband and I are waiting until the last of the kids leave home to do it, so it will have as little wear and tear on the new finish as possible! Until then, our poor old table needs some love! 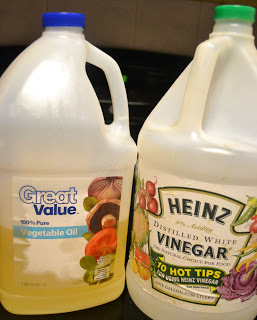 I have found the simple combination of oil and vinegar perfect for conditioning the wood (the oil) and cutting grease, removing stains and wax buildup (the vinegar). First I'll show you my before and after photo, then I'll share the recipe. The photo has not been altered in any way. It was taken just before and then immediately after using the conditioner. 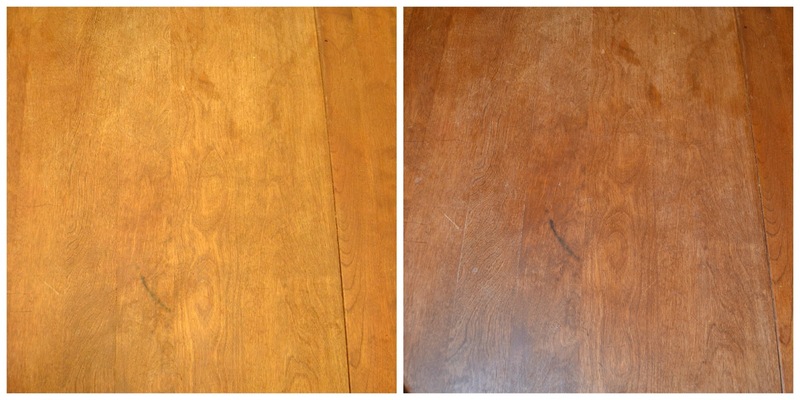 As you can see, the table still needs refinishing, but the conditioner has really brought some life back into the maple. There is no oily residue left behind at all. It just feels great when you run your hand across it. Mix together in a bowl and wipe on wood with soft cloth.